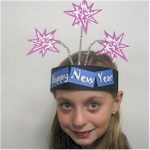 Make these DIY New Years Eve Party Hats for all your guests or set up the materials and let them make their own. There is a lot of time between dinner and midnight and a creative craft is a great way to fill the time. To begin I used a PSA Stamper and Peel & Stick Stamps to create the glitter paper scalloped circles pictured below. Next, I used the hole punch and elastic thread to create straps for our hats. Personalize your party hats by adding embellishments, the shinier the better! Young and old can participate in this activity. Be creative and start the New Year with a fun topper. Erin Sipes is a writer, crafter, and homeschooling mother of (soon-to-be) four based in rural Missouri. 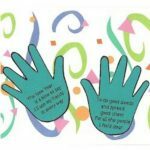 She is also the voice behind My Very Educated Mother, a blog dedicated to advocating the benefits of a creative home by sharing kids crafts and family-friendly recipes, as well as encouraging self-reliance, recycling, and responsible consumerism.